“Stand and deliver,” cried Ned Kelly, Australia’s most famous bushranger. That’s exactly what the Bushranger Joey does – it stands up proudly and delivers a terrific little travelling companion that’s well suited to hiding out in our rugged Aussie terrain. Like Ned Kelly, the Joey is a high-spirited and very capable bushman that will stand by its mates when the going gets tough. But when comes time to settle down for the night, this Bushranger supplies a host of modern facilities and luxury – and it’s ready for bed in just a couple of minutes! 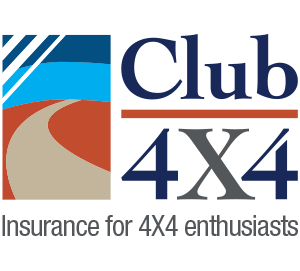 I’ve been lucky enough to have travelled with the capable little Bushranger many times and have recommended it to many would-be purchasers as I truly believe in its concept. This rugged little Aussie nugget is compact in dimensions yet comfortable, accommodating and packed full of sensible equipment. 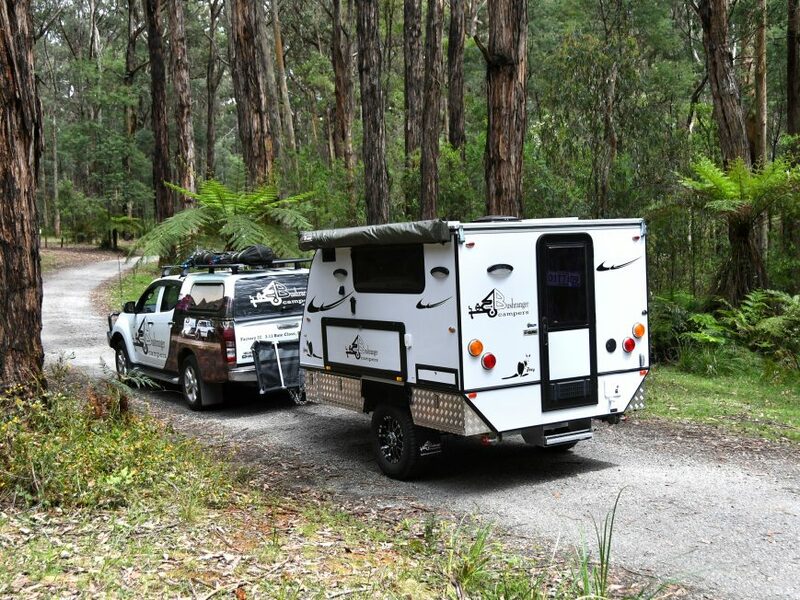 It is an ideal tourer for a couple, but with the simple addition of an Oztent connecting to the 270° Foxwing awning, it quickly becomes a large base camp for the family. It’s the simplicity and the security of the Joey that I like. It has particular focus on a travelling couple who enjoy the insulated protection of a hard-shelled camper. I don’t suffer extended and intricate set- ups well – I simply haven’t the patience. 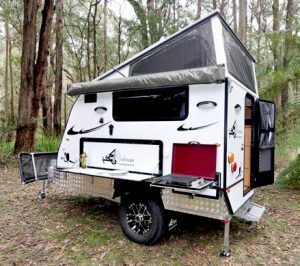 Yet with the Joey you can simply pull into your campsite, open the rear door, pull out the step, pop the hinged and gas- strutted roof and jump into bed. 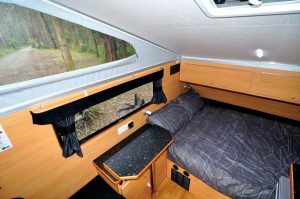 This makes it ideal for an overnighter when there are big miles to travel, but it is also great for a lunch stop, or maybe a “nanna nap” to break up a long journey. For a longer stay, you simply wind down the stabilisers and jockey wheel and fold out the awning – it really is as simple as it sounds. In fact it is quicker than setting up a swag and oh, so much more comfy! This Bushranger has a very strong base. It’s built on a full-box section galvanised chassis and features AL-KO Enduro Outback trailing arm, shock absorbed independent suspension that tracks beautifully on the asphalt. When you head off-road the 1220kg tare load tracks extremely smoothly over corrugations, craggy ground, rocky inclines and muddy bogs. The 15-inch allterrain tyres with attractive alloy wheels provide excellent ground clearance, while the short wheelbase allows very good maneuverability in tight terrain with minimal rear overhang to reduce bum drag. There are two 60-litre poly water tanks fitted high into the chassis and well shrouded to avoid damage. At 2.3m height overall, the Joey has good wind resistance for towing economy, and it will also fit into many domestic garages and carports. 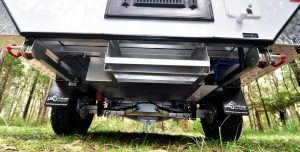 It can be easily towed by mid-sized vehicles and with a beam of 2.02 metres, tracks within the footprint of most RVs. Like all bushrangers, its compact dimensions will get you into plenty of fun-filled trouble, but its size and weight gives you a “get out of gaol free” card to keep on going. My old mate and TV/radio personality Tim Smith once said, “It’s not the size of the dog in the fight, it’s the size of the fight in the dog” about the Bushranger Joey. The Joey’s main shell is constructed of a strong insulated composite with aluminium exterior, thick foam insulation and a rich Beech internal finish all set on a strong frame. The entry is a via a door in the centre of the rear wall, which I know worries some from a dust ingress point of view but with the door vent covers in place, I towed the Joey all over the Flinders Ranges and back and never had any cause for concern. The rear-mounted doorway also lends itself to a terrific internal layout. Outside, you get a slide-out twin burner gas cooktop with grill plate plus a long fold-down table to enjoy the camper lifestyle on the kerb side of the L-shaped awning. There’s a large caravan-style window with fly screen and internal curtain, and the undersides of the tub feature checker plate alloy wear panelling with a series of storage compartments, including a full width pole carrier up front. 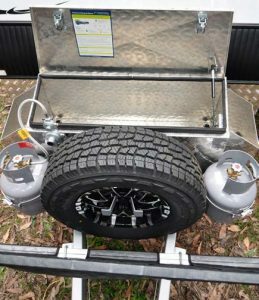 On the drawbar, we find a Treg off-road towing coupling and removable jockey wheel plus a strong stone guard, spare wheel and twin gas bottle carriers. Then there’s a large alloy toolbox to carry plenty of toys, recovery equipment and bush gear. 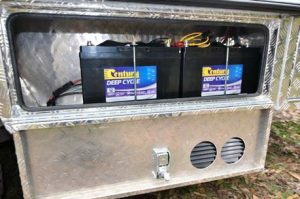 There are even a couple of jerry can holders that would double as firewood holders or carriers for wet and muddy shoes, wet suits, and the like. The front wall of the Joey is curved to reduce towing drag and has stone protection down low. The driver’s side reflects the large window of the kerb side, making the internals light and airy when required but cosy and insulated when needed. There’s also an external hot/cold shower, more LED lighting and even more under-body storage boxes. Overhead the roof is thickly insulated with our demonstration unit carrying twin 120W solar panels to assist the Anderson plug and Projecta Smart Charge VSR battery charger/ management system in keeping the dual 100-amp AGM batteries fully charged. There is also a hatch for added light and ventilation. Step inside and you will be pleasantly surprised; it’s a long way from the old Cobb and Co stagecoach Ned used to rob! You get most of the luxuries of a caravan but in a more condensed package. I was impressed, not only at the quality of the fit-out and the amount of accessories inside the compact body shell, but also by the functional design and selection of textures and fittings. Our review camper had a double bed on an innerspring mattress across the front of the camper, a small dinette with a triple-fold table to the left and a kitchen to the right. 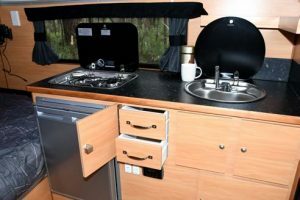 For such a small package there was plenty of cupboard space beneath the bench, a two-burner Smev cooktop, a stainless steel sink with a mixer tap and an 80-litre Waeco upright compressor fridge that really showed its worth on our Flinders Ranges expedition. It maintained our sustenance at a satisfying, even temperature even when the outside temperatures fluctuated wildly from blistering heat during the day to freezing at night. The quality of the cabinetry is really very inviting inside. 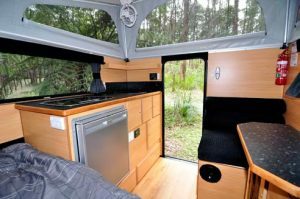 It feels rich and warm with the plush timber finishes, laminated timber edge benchtops, an optional 19-inch 12V/240V LCD TV/DVD, Bluetooth sound system, Sirocco fan and attractive upholstery. Overall, it has a nice feel and I layout for a travelling couple, plus you can be assured of a good night’s sleep after a long day on the road with a bed that stays permanently assembled for even greater ease. 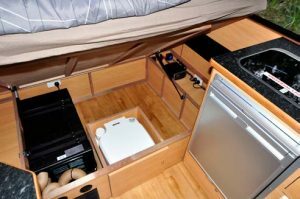 Under the bed is a large storage area that also houses the Projecta 25-amp charger/BMS, Finch heater/air conditioner plus a pull-out cabinet for a portaloo. Bushranger offers a Finch 240V air-conditioner/heater option that really came in handy when we suffered 45°C Broken Hill desert heat. If you don’t want to sleep with your trail mate, they also offer a twin bed version. 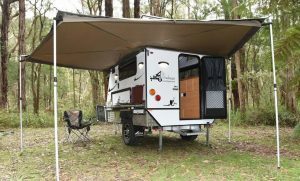 Bushranger Campers is a small family operation offering a truly personal buying experience that is backed by a two-year manufacturer’s warranty. The Joey is ideal for life in that remote hide-out or for a quick getaway. This Bushranger won’t leave you hanging!